Happy Monday! I hope you all had a great weekend! I had a little time this weekend to sit down and think about a decorating direction for the most neglected room in my house; my master bedroom. We’ve been so focused on making the main living areas in our home comfortable, very little thought has been put into our Master bedroom. We’re still not quite ready to spend a lot of money on this room, but it’s good to have an idea of what direction to go in, so we can pick things up a little at a time, preferably when we find them on sale. Here’s a picture of what the room looks like right now. Not terrible, but certainly a long way from what we’d like it to look like. The wall paint is fairly new but I don’t think it’s going to work with the gray and cream color scheme I’m aiming for. We’ve had the furniture for several years (not shown: matching armoire and tall dresser), and while it’s still in great shape, we’re ready for a change. The bedding and side tables can definitely go. Some day we would like to add wood flooring to all of the bedrooms, this one included, but that’s going to have to wait awhile longer, as the carpet is in pretty good shape and flooring is not a priority. So, stay tuned for some changes! I’ll post updates as we go, but I’m warning you now, it’s going to be a slow process. What do you think of my design plan? I’d love to hear your thoughts in the comments below! 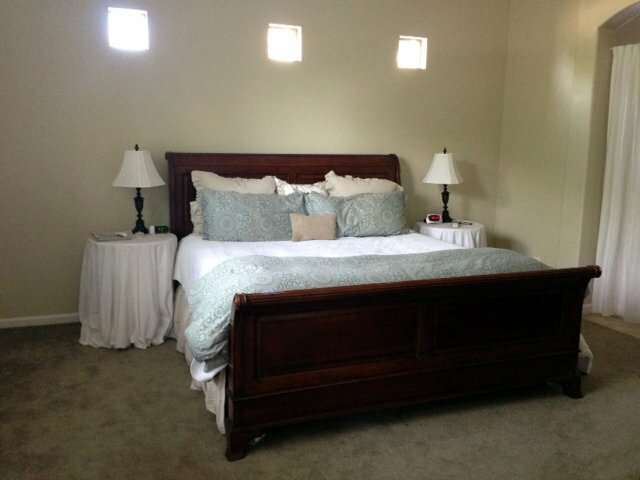 Another partner in master bedroom updating! I absolutely love your board Amy, I may steal some of these ideas for our master bedroom update too I so wish we had gotten an upholstered headboard when we upgraded a few years ago, but we’re stuck with the wood, luckily we’re planning on alot of the same palette as you so it’ll still be clean and bright. Can’t wait to see what you do! Thanks so much, Emily! I can’t wait to get started on it! I’ll definitely be following along with you to see how your room turns out, as well! Thank you, Christine! That’s such a compliment coming from you – you have amazing taste! I hopped over from ‘A Stroll Thru Life’. I have just posted my master bedroom makeover, it isn’t finished yet but most of it is in place and I only strayed a little from my original mood board. I do love the colours you have in your board, very similar to mine although I have added a pale blue, floral duvet. However, winter time I intend to replace this with a plain, grey linen duvet. Your room is going to look fabulous, replacing the dark wooden headboard with a lighter colour will lighten and brighten the whole room, can’t wait to see it finished. Off to look at some of your other reveals now. Thank you so much for your sweet comments! I’m excited to get started with refreshing this space – I think it will make such a difference! I’m so glad you stopped by – I’m heading over to check out your mood board next! Gorgeous inspiration board. Can’t wait to see it all done. Thanks tons for linking to Inspire Me. I love your color scheme! I’m hoping to (one day!) 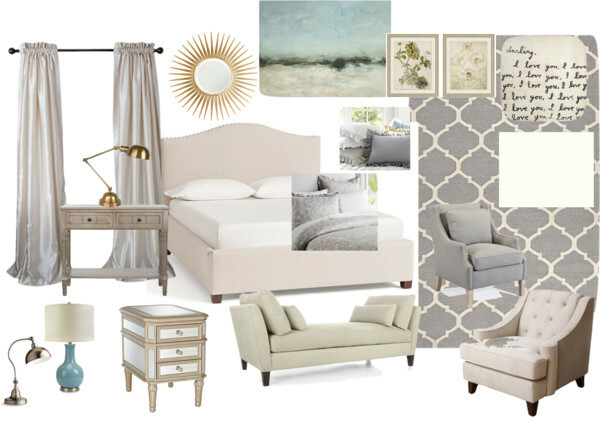 re-do our master bedroom but like you…it’s a slow process! Thank you! I’ve been wanting to do this for such a long time, I can’t wait to get busy! Amy, this room is going to be beautifulllllllll! I love everything you chose for it. We’ve been working on our master bedroom for about a year now. I think taking your time is a great idea. Like you said, it’ll allow you to get what you want, and hopefully on sale, instead of settling. I can’t wait to see it when it’s all done! Thanks so much, Iris! I can’t wait to start working on it, even if it does take me forever to finish! Thanks so much for stopping by! Beautiful selections! Thanks for sharing at Home Sweet Home! This is just dreamy and beautiful! Love it all! I’m featuring you this week at Friday Favorites. Thanks for linking up!